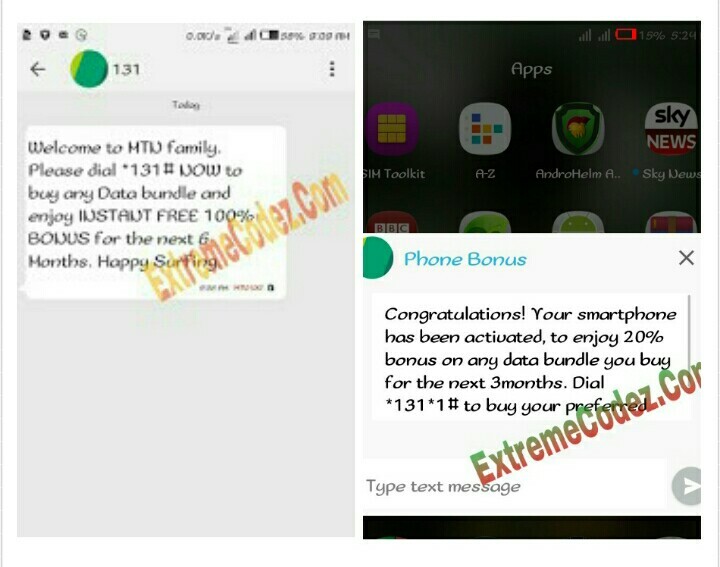 Do you know you can actually get MTN data double offer bonus once you buy a new smartphone and insert your mtn sim card on it within 15minutes mtn will send you an SMS that your smartphone has been activated for data double bonus offer which have a duration of 6 and 3 months? Yes! It sure for real. Now the problem is that, What of those who don't have the money to buy a brand new smartphone, can not enjoy this offer, but never to worry You can get the offer by using this alternative, by tweaking a valid IMEI from an eligible smartphone. Basically it's well known that most smartphones is dual sim which is to say (two-sim) Phone1 and Phone2 but it not necessarily that you change the both you can change one and that will do the work. These valid IMEIs are always generated from an eligible or supported smartphone in order for those who are not eligible to also enjoy the offer for a period of 6 and 3 months. However, if you are among those who have not gotten this offer, you can follow us along as we unveil the details and it's procedure. 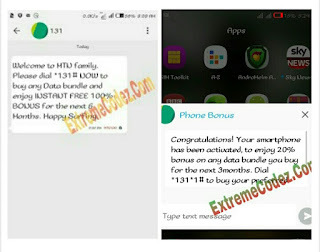 on how to get the mtn double offer for 6months and 3without buying a new smartphone. Don't know how to Tweak, See procedure by Clicking here. Download IMEI Analyzer, by Clicking here. Now, dial *131*1# to buy any MTN data plan and it will be doubled immediately which means you will be given 100% double data on that purchased data plan. Always dial *559*2# or SMS 2 to 131 to check your data balance. Before diving into how to get this 20% offer you must know that you have to take down your phone 1 imei number which is just 15numbers as this trick only works fast and saves you from stress with you using your own phone imei number. Now copy it, after that you need to get rid of the last 5number, getting rid of it is to make up another 5numbers by yourself to complete the remaining 10numbers left. Now check the whole number the last 5number will be replaced with the one you will form. 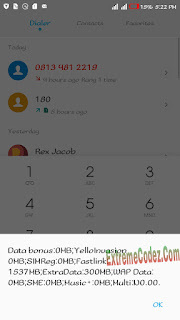 for Example if your imei number is something like this 357168017843892 get rid of the 43892 now form yours like this 57290 after that, you gat to add 57290 to the left 10number to complete it 15numbers. And if you successfully done it right you will get an instant messaging from Your network Mtn. Congratulations! Your smartphone has been activated, to enjoy 20% bonus on any data bundle you buy for the next 3months. Dial *131*1# to buy your preferred data plan. You can now enjoy 20% of all data plan you buy for the next 3months. Now, dial *131*1# to buy any MTN data plan and it will be 20%, which means you will be given 20% data on that purchased data plan. Next, dial *131*1# to buy any data plan from the weekly or monthly plans to get it doubled instantly. How To Check Data Balance? With the above procedures you will be able to get the 100% and 20% offer without buying a brand new smartphone. Just don't read and go kindly use the share buttons below to share this post to your friends so that they can also benefit from it too. 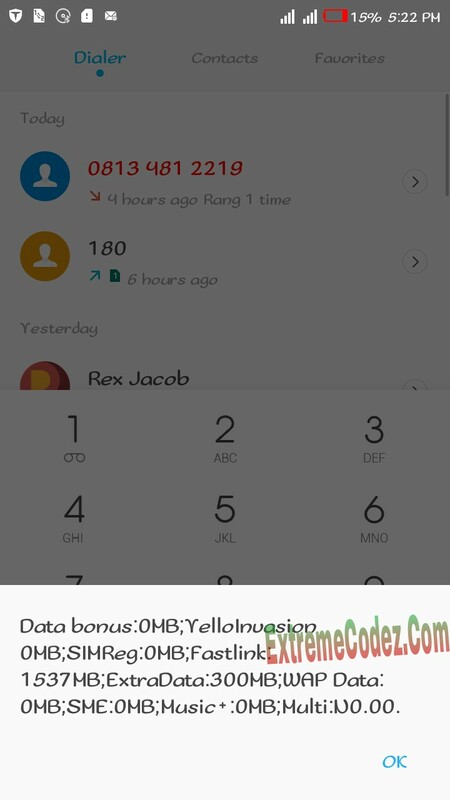 If your having issues tweaking your imei number use the comment box and we shall help you out. Please can you guess help me with the imei number for 100% double your data? And can one change the imei later to the original imei?